Are you are ready for Fall as I am? Colorful leaves, corn mazes, cider, sweaters, and PUMPKIN! What's not to love? Well, I have a fabulous Weight Watcher's recipe to share with you today for Skinny Pumpkin Muffins. I found this at See Cupcake Run. 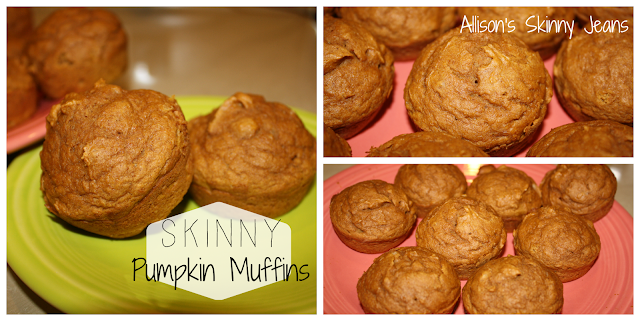 Easy, delicious, and skinny!! 1. Preheat the oven to 350F. Spray muffin tins with non-stick cooking spray. I wouldn't use liners - they'll stick!! The recipe says it's supposed to make 24 cupcakes - I made 12 and a few little bundt cakes. 2. Mix all the ingredients together in a large mixing bowl. Fill each tin 2/3 full & sprinkle some cinnamon on top if desired. 3. Bake for 20-22 minutes. These are so cute to make as mini bundt cakes! These are so moist and delicious! Make sure to pace yourself - downing the whole batch cancels out the skinny part. I'm am with you on skinny muffins! Love them! Hi Allison! Visiting from Tuesday Trivia and following you via Bloglovin'! I lost weight on Weight Watchers about 6 years ago so I LOVE their recipes....how did I miss this one? I love pumpkin too! So, I was thinking maybe I can use this recipe in my new mini donut pan? Why not? That's a great idea! You could make a little glaze to drizzle over them and feel like you're actually getting a donut! YUM! :-) Let me know how they turn out or send me a picture! These sound awesome! 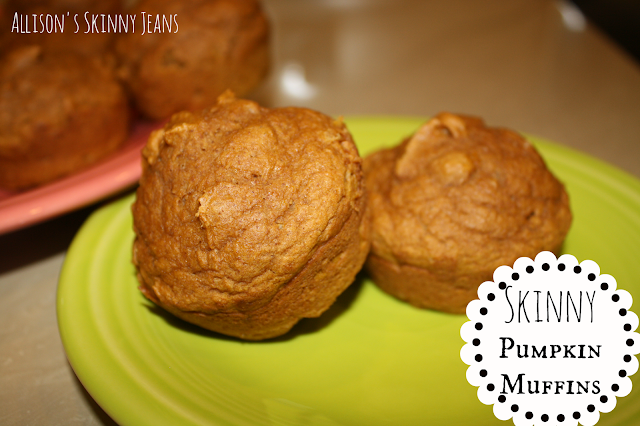 I'm all about skinny recipes - can't wait to try these pumpkin muffins! Pinning now! Let me know how you like them! There are my favorite muffins - so moist! omg! My favorite ever is pumpkin anything! I am TOTALLY going to try this! 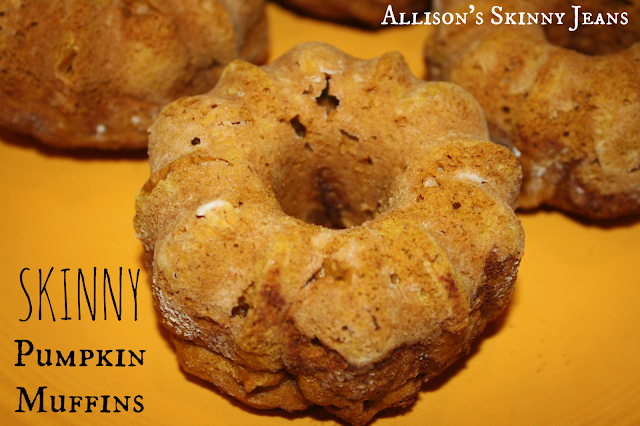 Have you ever tried making these with real pumpkin? In a couple of months I am going to feature my pumpkin pie made from scratch :D I have been wanting to try other pastries with real pumpkin now too. Wow these look delish!! I am obsessed with pumpkin anything lol. In a couple of months I will be featuring my homemade from scratch pumpkin pie. I tried it last year and I was AMAZED! I have been wanting to try other pastries with real pumpkin too. Have you thought about it? My mom used to cook her own pumpkin - I'm sure it's even more amazing versus the canned pumpkin. I know it's definitely a process. I LOVE pumpkin! Let me know how you like them! Where did you ever find those mini bundt pans??? They look sooooo neat like little donuts that have ridges on them... Love em along with almost anything pumpkin.. They are actually my mom's. I think you can find them most anywhere - Target, Walmart. They are so fun! Make sure to grease them really well!